Bluetooth Adapter for PC, Bluetooth 4.0 USB Nano Wireless Dongle Compatible with PC Desktop Computer with Windows 10 8.1 8 7 Vista XP, Support Bluetooth Headphones/Speakers/Mouse/Keyboard and More. Inamax Bluetooth USB dongle add Bluetooth to your Windows computer and open the door to cordless convenience with Bluetooth headsets, headphones and speakers, along with Bluetooth mice, keyboards, and other devices. * Ultra-compact, easy carrying and space saving. * Bluetooth Low Energy (BLE) protocol support. * Compatible with Windows 10, Windows 8, Windows 7, XP,Vista. Q: Can I use this together with my Windows computer's built-in adapter? A: No. If you have ever used another adapter on the computer all, drivers for it must be removed before plugging in this adapter. Q: Will this work with my TV, home theater equipment, or my car stereo system? A: Sorry, this device will only work when plugged into supported Windows computers. Even though TVs, home theater equipment, and stereos have USB ports, they don't have the necessary drivers to support this adapter. Q: Why is the audio quality so terrible? 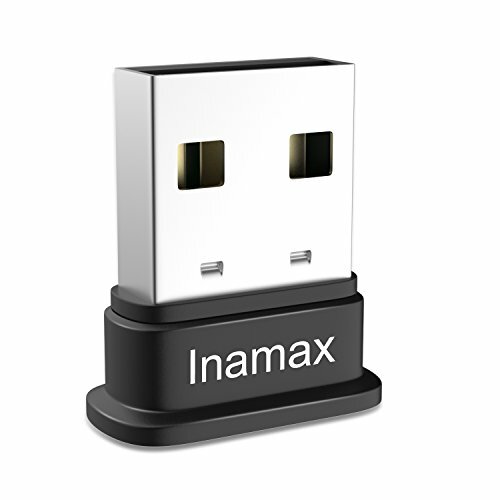 Warranty:Inamax Bluetooth Adapter is backed by our 1 year limited hardware warranty. For any question, please feel free to contact us via email: sales@inamax.cn and we will responds to your within 24 hours. 1) Bluetooth-enable PC / Laptop - Creates cable-free connections between PCs and other Bluetooth devices such as Bluetooth enabled headsets, speakers, cell phones, keyboard, mouse and more other Bluetooth devices at speeds of up to 3 Mbps. 2) Universal Compatible with Windows - Support Win 10, 8.1, 8, 7, Vista and XP. Automatic install through Windows Update in Windows 10 with default Bluetooth stack. Others, you can use included Licensed CD driver. Does NOT work in car stereo systems or TVs. Does NOT work with Mac. NOT recommended for employer-provided computers. 3) Up to 33ft/10m - wireless data exchange, audio Music Stream Enhanced Data Rata (EDR) compliant for both 2 Mbps and 3 Mbps modulation modes. 4) Bluetooth 4.0 technology - With low energy (BLE) technology and it is backward compatible with Bluetooth V3.0/2.1/2.0/1.1. 5) Ultra-compact Bluetooth USB Adapter - Easy carrying and space saving, allows you to leave it on laptop or PC and forget it. If you have any questions about this product by Inamax, contact us by completing and submitting the form below. If you are looking for a specif part number, please include it with your message.